War-date Confederate Document Signed “George W. Kurtz, Capt. Co. ‘K’ 5 Regt. Va. Vols,” 1pp. 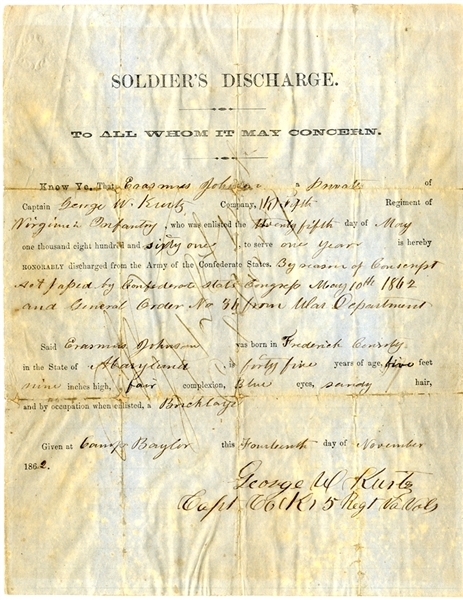 quarto, November 14, 1862, Camp Baylor, being a discharge for Erasmus Johnson, private in the 5th Virginia Infantry. Very good condition. Erasmus Johnson, enlisted in May of 1861, Winchester Rank: private into Co. K, 5th Virginia Infantry, "Continental Morgan Guards".